Walter Binger was born in New York City on January 16, 1888, to S. Gustav and Francis Newgass Binger. He graduated from the Massachusetts Institute of Technology in 1916 with a bachelor’s degree in civil engineering. Binger published two books on civil engineering: What Engineers Do: An Outline of Construction in 1928 and What Engineers Do: Engineering for Everyman in 1938. Binger continued as a consulting civil engineer throughout his life and was a member of professional organizations such as the American Society for Civil Engineers and the Visiting Committee of the Massachusetts Institute of Technology Department of Civil Engineering. He passed away on May 17, 1979. Walter Binger played a leading role in a number of mid-century New York infrastructure projects, including the East River Drive and Harlem River Drive. To the preservation community, he is remembered for his technical assistance to the opponents of Robert Moses’s plans in the 1940s to build a Brooklyn-Battery Bridge, and for his role in preventing Moses from demolishing Castle Clinton in Battery Park. In 1939, Binger and the famed civil engineer Ole Singstad were asked by Manhattan Borough President Stanley Isaacs to analyze the visual impact of Robert Moses’s proposed Brooklyn-Battery Bridge and evaluate Moses’s purported cost figures. Isaacs used Binger and Singstad’s analysis to demonstrate to the press the aesthetic impacts of the bridge, which Moses had downplayed.5 The analysis convincingly showed that the bridge would have obstructed views between New York Harbor, lower Manhattan, and the Brooklyn Bridge and spoiled the environment of Battery Park.6 With respect to costs, Binger found that, while Moses had claimed that the bridge would be fully paid for by bonds, Moses had failed to account for necessary highway connections and park reconstruction. Binger concluded that, far from being costless to the City, Moses’s bridge would require an outlay of $21.5 million.7 Despite the concerns raised about costs and visual impacts, in early March 1939, the City Council approved Moses’s bridge. The project was eventually blocked by the War Department and the Brooklyn Battery Tunnel was built instead. 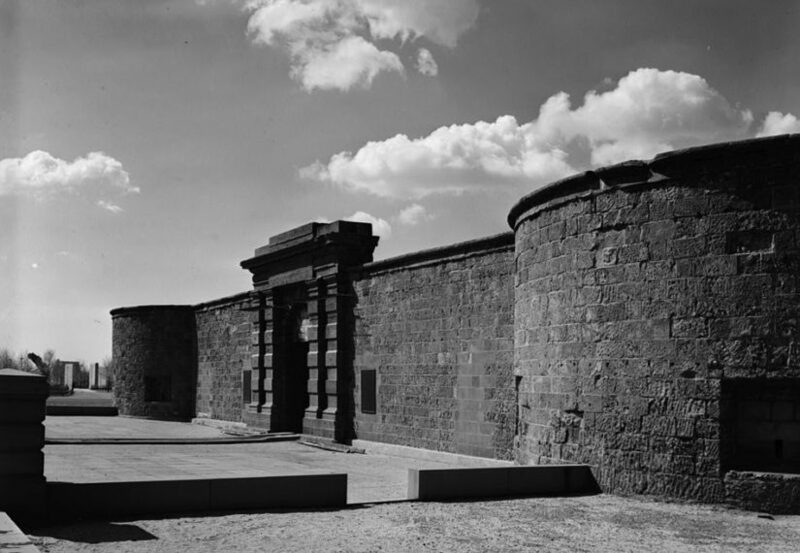 After World War II, Walter Binger was among the most persistent voices fighting to save Castle Clinton, the historic fort in Battery Park that Moses tried to demolish, apparently out of personal animus towards the bridge opponents.8 Binger obtained a key to Battery Park, which Moses had shuttered behind high fences for the duration of the war, and inspected the structure with C. C. Burlingham, a retired civic leader. The two men found that, contrary to Moses’s assertions, the historic stone walls were still standing, hidden behind debris. Binger also refuted Moses’s argument that it would be necessary to demolish the fort in order to build the Battery Park highway underpass beneath it.9 Binger later helped bring a lawsuit to prevent Moses from carrying out the demolition order on the walls granted by the Board of Estimate. His attorney, Frederick Van Pelt Bryan, obtained a last-minute injunction from a Supreme Court justice just as Moses was destroying the massive doors at the fort’s entrance.10 This injunction was but one episode in a protracted legal campaign waged by supporters of preservation for several years which was ultimately successful in preventing the demolition of Castle Clinton. Melissa Brunette, “An Oral History Interview with Bronson Binger,” New York Preservation Archive Project, 17 October 2008. George Goodman, “Walter Binger, 91, Aide to LaGuardia: Civil Engineer Designed East River and Harlem River Drives,” The New York Times, 17 March 1979. “Binger, Walter D.; ASCE Fellow (1888-1979),” American Society of Civil Engineers. Article retrieved 11 January 2013. Robert A Caro, The Power Broker: Robert Moses and the fall of New York (New York: Knopf, 1974), page 646. William R. Conklin, “Battery Bridge Plans Put Through in a Rush,” The New York Times, 2 April 1939. Robert A Caro, The Power Broker: Robert Moses and the fall of New York (New York: Knopf, 1974), page 658. Anthony C. Wood, Preserving New York: Winning the Right to Protect a City’s Landmarks (New York: Routledge, 2008), page 55. Robert A Caro, The Power Broker: Robert Moses and the fall of New York (New York: Knopf, 1974), page 684–85. Walter D. Binger, “Fort Clinton Restoration,” The New York Times, 31 August 1946. Walter D. Binger, “Judging National Monuments: Park Commissioner’s Concept Disputed, Legal Opinion Cited,” The New York Times, 3 January 1949. Osborn Gardner, “Restoration of Fort Clinton: Stand Taken by Representatives of Groups Is Pointed Out,” The New York Times, 5 April 1947.